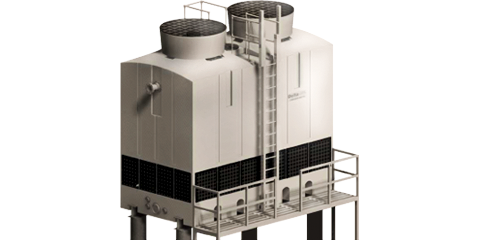 Cooling towers are readily identified by their ubiquitous presence in large commercial cooling systems. They are an effective means of rejecting heat from from a centralized liquid system. The general operating principle of a cooling tower involves a thermal and mass transfer from the cooling water to the surrounding air. The water is distributed by a number of means throughout the cooling tower fill, drastically expanding the surface area of the water. Air from the surrounding atmosphere is moved across the water surface. Assuming that the air is within the performance range of the cooling tower, the resulting evaporation of a portion of the water cools the liquid water remaining behind. There are other applications for cooling towers, and Delta Cooling Towers, Inc., described one in a March 2017 news post. The application centered around a municipality with two challenges in providing potable water to residents. The water was being sourced from very deep wells and, without treatment, had an unacceptably high delivery temperature. Additionally, the sourced groundwater exhibited unacceptable levels of radon and hydrogen sulfide, naturally occurring gaseous contaminants that required level reductions to render the water suitable for human consumption and use. Air strippers, equipment that aerates the water, are a common means of reducing the gaseous contaminant levels. In this case, though, there was the additional challenge of reducing the water temperature. All needed to be accomplished at process flow rates commensurate with the size of the municipal water demand. A solution that solved both issues arose with the use of a cooling tower selected to provide sufficient aeration for gaseous contaminant reduction and cooling of the water to acceptable levels. You can access the entire case history by reaching out to a product specialist, with whom you should share your own liquid processing challenges. Combining your process knowledge and experience with the product application expertise of knowledgeable professionals will produce effective solutions.